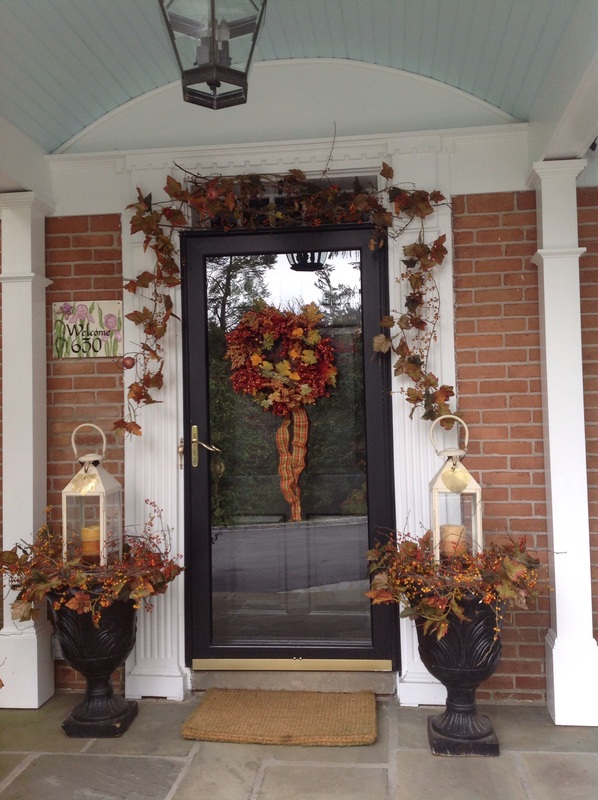 The goblins and ghosts of Halloween have come and gone and the fall mums are all spent yet there is a whole month ahead before the holiday decorations go up. The front porch definately needed sprucing up for Thanksgiving. My solution? Foraging for wild bittersweet vine and fallen osage oranges, those glorious lime green orbs. I recycled everything else from what I had around. Zero cost and a fresh welcome throughout November. 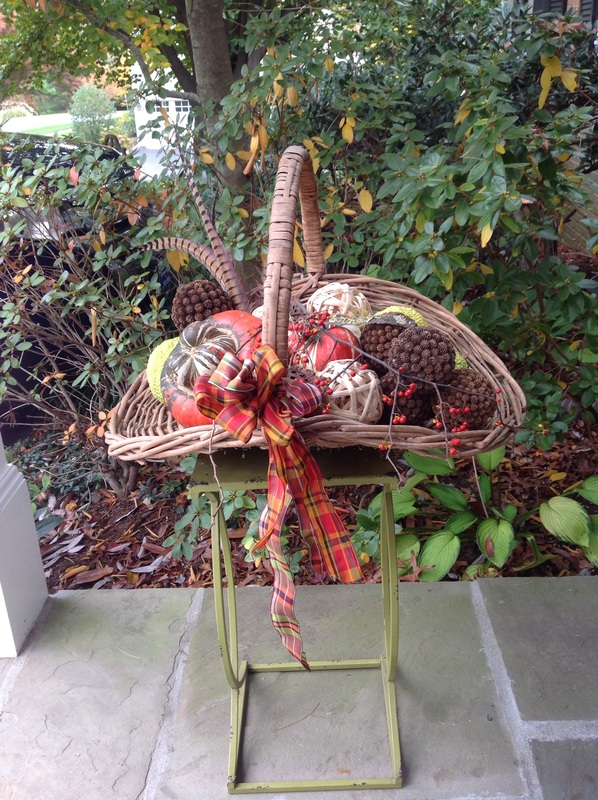 Take a look and maybe you will find some ideas for your own outdoor Thanksgiving decorating. 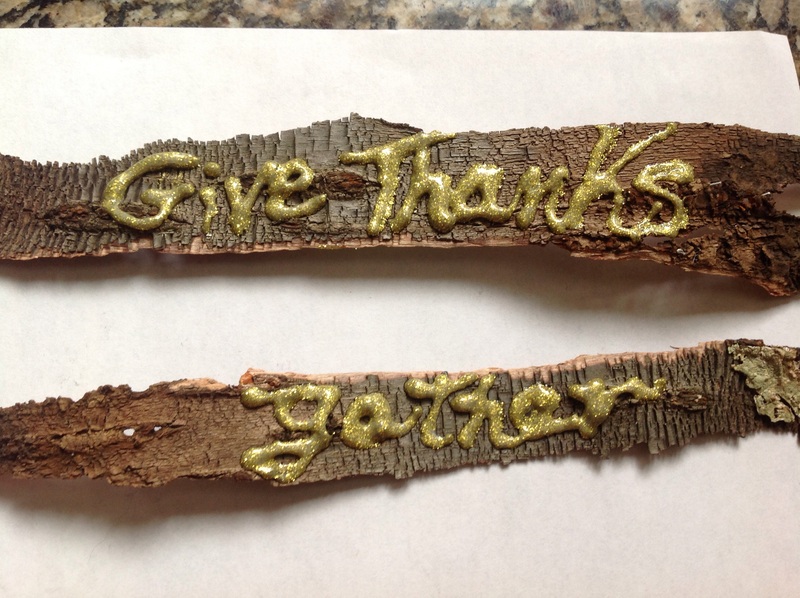 The bark with inscribed Thanksgiving greetings. The second one will rest in a basket of gourds. 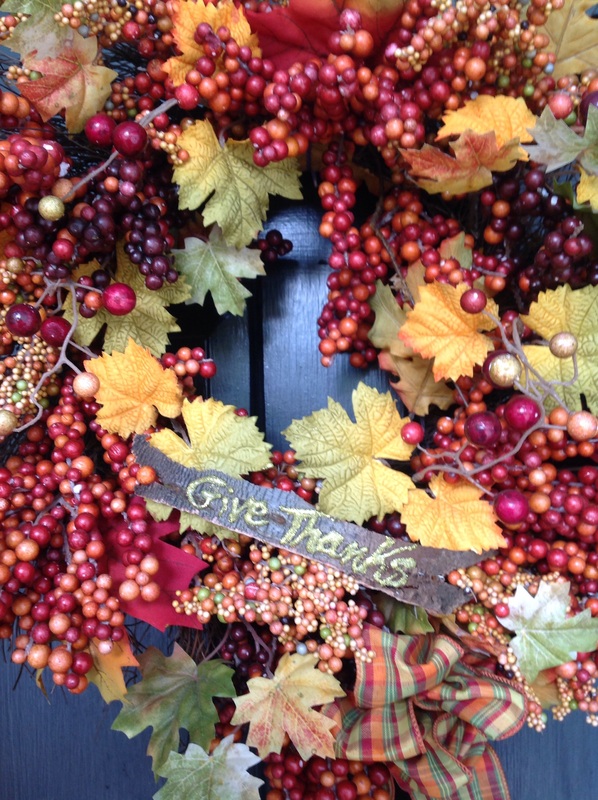 This idea could be adapted for place cards at your Thanksgiving table. 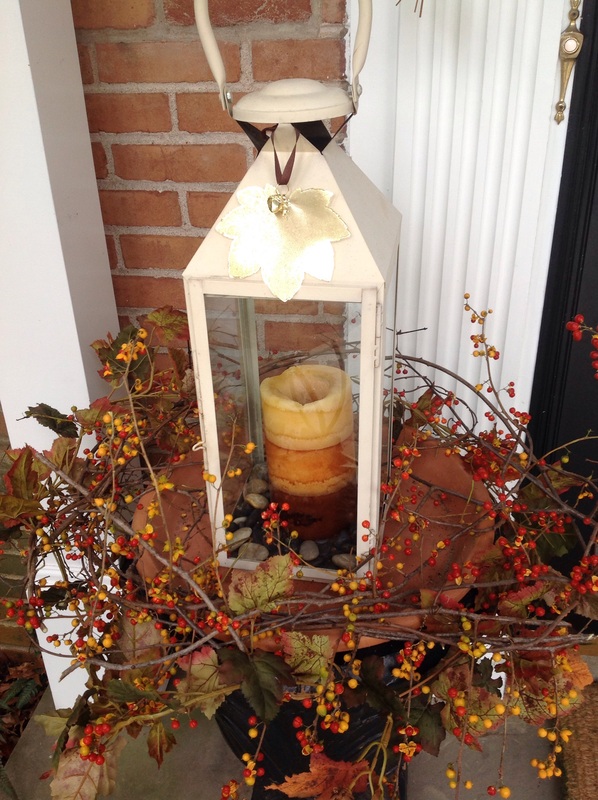 I placed 2 lanterns with fall colored candles on top of black urns. They are seated on terra cotta saucers to keep them secure. Around each I wove fresh bittersweet and a silk garland of leaves. 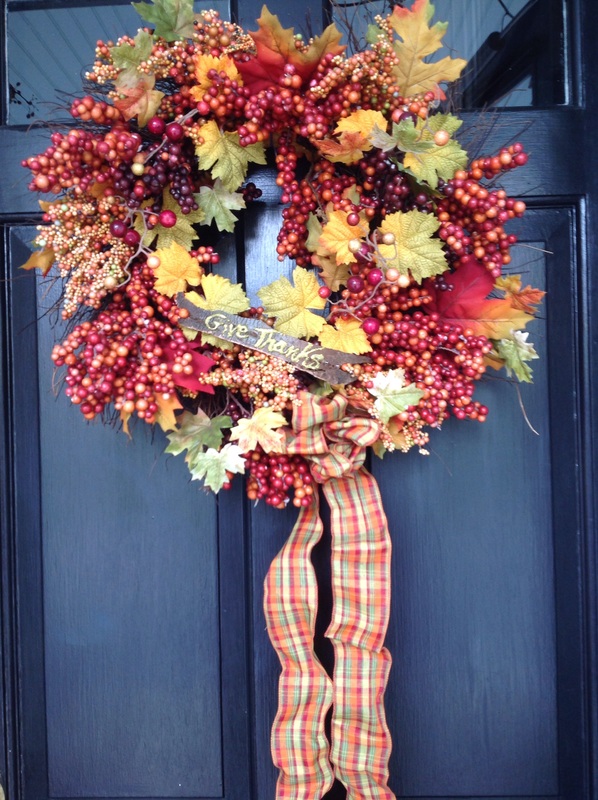 The door is outlined in a similar garland for a bold colorful welcome. Don’t you love the exuberance and unruly nature of bittersweet? Each lantern is topped with a gold dipped leaf ornament. The gold compliments our front door hardware and ties in the gold glitter lettering on the bark strips. 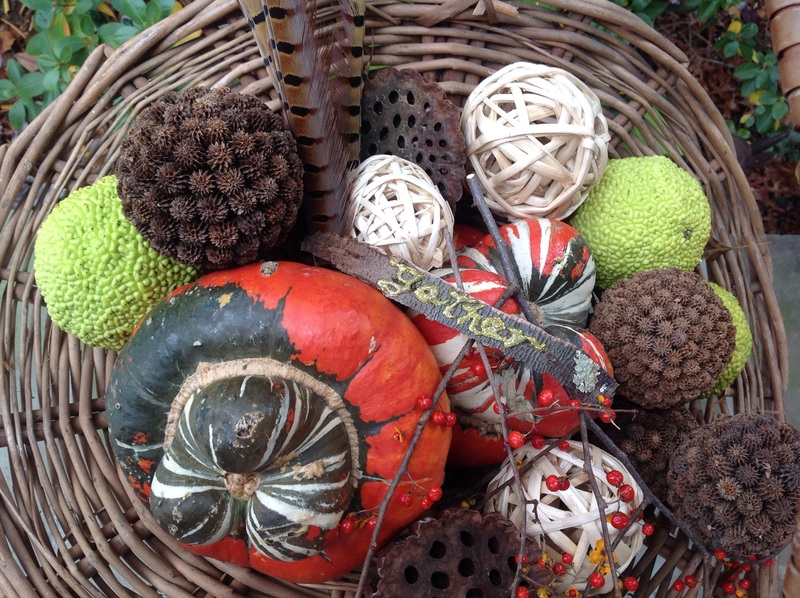 To one side I placed a flower basket on a small chartreuse table and filled it with Hubbard squash, rattan spheres, pine balls, Osage oranges and pheasant feathers. 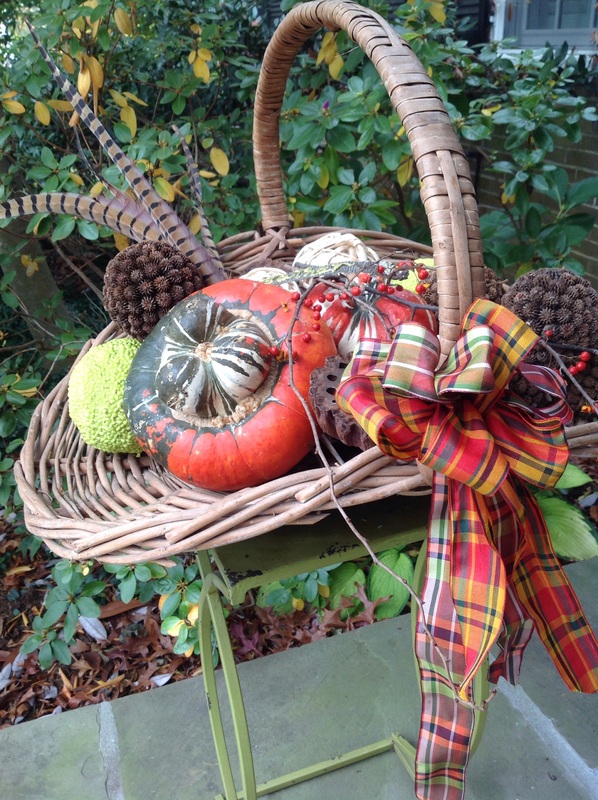 Plaid ribbon and bittersweet vine give the basket some polish and ties together the color theme. This is my take on a horn-of-plenty. 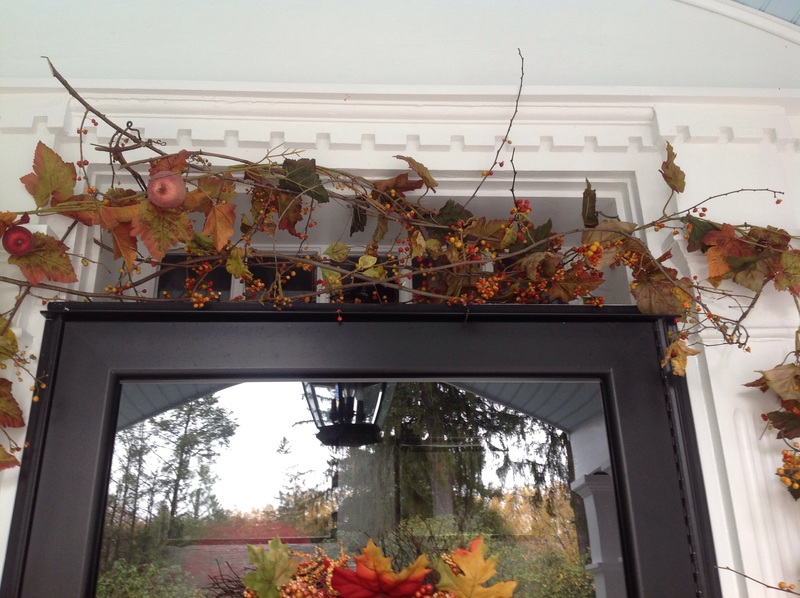 Detail of the top of the door with an abundance of bittersweet curling around a silk garland of leaves. Adding the fresh bittersweet to the artificial garland gives it more texture, dimension and a natural appeal. 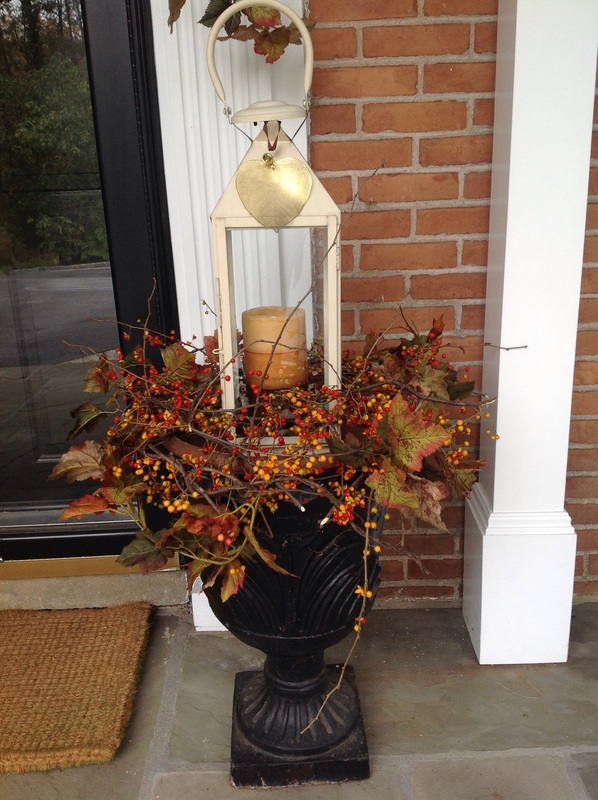 This entry was posted in Gardening, Home Décor and tagged Front porch dècor for Thanksgiving, thanksgiving on the front porch, Thanksgiving planters with bittersweet vine and lantern by Johanne Lamarche. Bookmark the permalink. Very festive and colorful at no expense but time well spent with visual reward. See you tomorrow. Thanks. Love playing with bittersweet! See you tomorrow! So lovely, Johanne. I feel even more behind now… I better start taking down my ghost and spiders!! Meant to inspire not stress Josette! I change my porch all the time because I love decorating projects. Enjoy your spiders and ghost! Everything is just gorgeous Johanne! My mums have croaked so these are great ideas! I can never get my mums to make it to Thanksgiving. Grrr…and there aren’t any more for sale except florist mums which don’t tolerate the cold. I have a big patch of bittersweet I can share!